Nokia is either dead, or saved by the strategy explained in this article. I give 80% that it’s dead, but 20% is still a chance. And if Windows Phone does take off it will be the miracle that Nokia needs. Problem is that WP should it be a success, it is also available for HTC and Samsung. Indeed it is HTC not Nokia who is the number one biggest seller of Windows Phone now. But Windows Phone sells 15K units a day worldwide and falling and Android 550K and growing fast. Nokia surprisingly still sells close to a million phones a day, most are cheap phones but still the largest maker by units. But HTC and Samsung have destroyed Nokia’s market in smartphones by adopting and thriving with Android and effectively together with iOS killing Symbian. So betting on WP is betting on a platform that as it stands nobody wants and if by thanks to Nokia it succeeds then Samsung, HTC and others will have it as well. Not only it is hard to understand why Nokia went with Windows Phone but also why it went exclusively with Windows Phone instead of having Android as well. Nokia married Microsoft but Microsoft gets to sleep around. 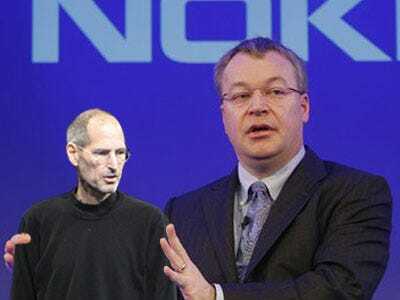 Image via WikipediaWhat is best to be Nokia or Apple? When you look at Apple´s financials and compare them to Nokia financials you clearly see that Nokia is doing much better than Apple except on one item: Market cap. This is the same with Microsoft and Google except that Microsoft´s market cap is still higher than Google´s. But the concept is the same. Investors give the Silicon Valley companies a much higher P/E. They believe that Apple and Google are on the rise, and Microsoft and Nokia on the decline. Looking at this and knowing about all the common ties including common board members that exist between Google and Apple I wonder why Nokia and Microsoft don´t have closer collaborations, especially now that Apple has gone after Nokia´s lunch, high end phones. But Nokia still sells in only one week as many phones as the iPhone has ever sold. Investors lose track of this. And Nokia´s CEO Olli-Pekka Kallasvuo seems to have a clear view of who his competitors are.